A cold, foggy day entices the Biggs family to go on an adventure and get out of the house. 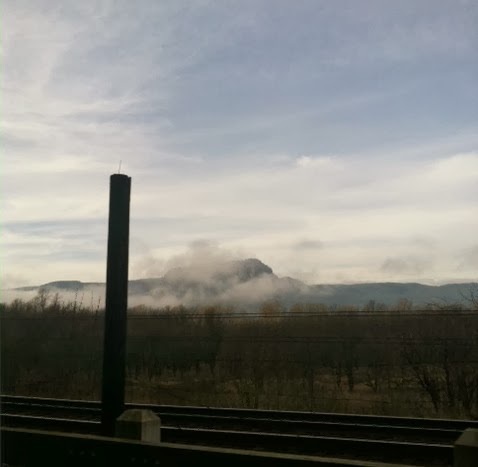 The Gorge is the place to go, a place with scenery and history, and a lot of photo opportunities. The Gorge is one of my favorite places in Oregon, and holds my favorite waterfall, Wahkeena falls. 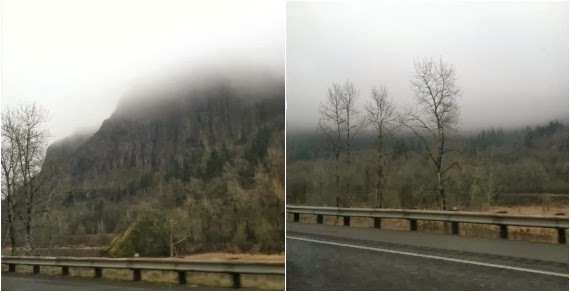 The drive there was so foggy, beautiful, white clouds hung low, covering the trees and caverns that open up the walls of rocks that line the I-84. 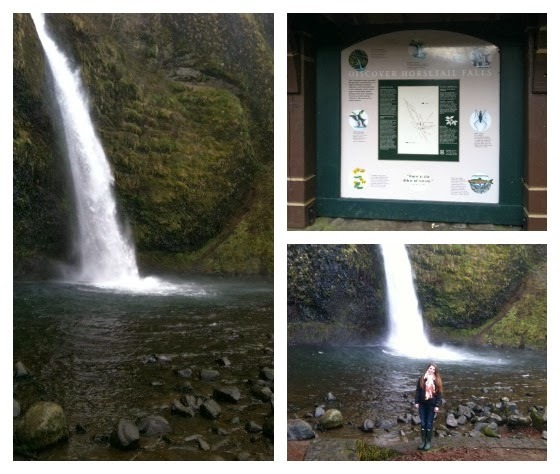 We went to three waterfalls today, all on the same scenic highway, just a small distance from each other. 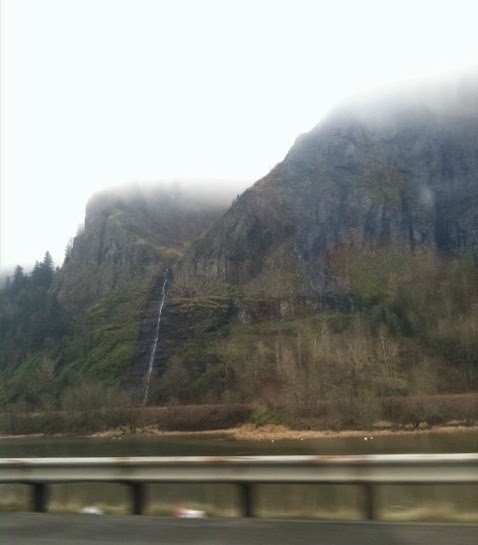 We back-tracked, stopping at Horsetail falls first. Some people call it "Pony Tail Falls", but it is in fact Horsetail Falls. My mom and my dad are in the first picture here. 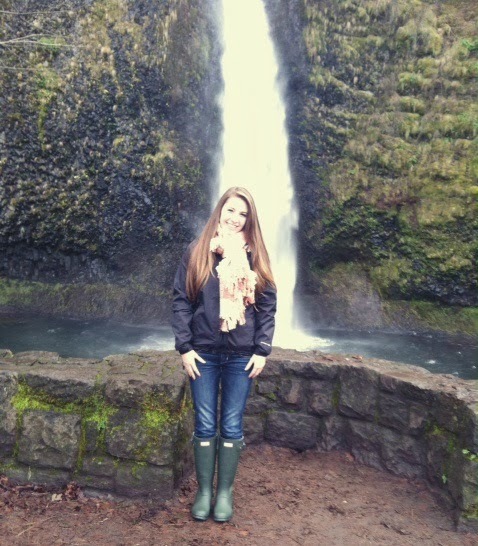 Behind me, you can see the mist from the falls crashing down. 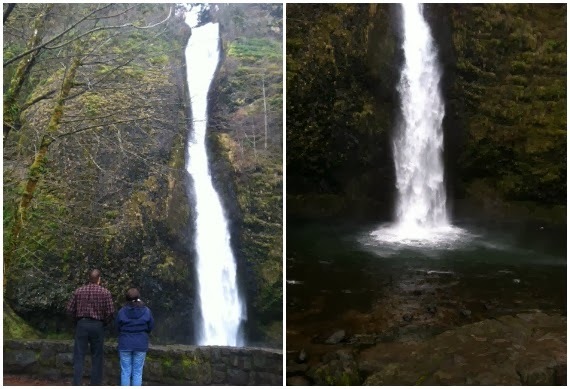 After shivering for a few minutes at Horsetail Falls, we drove down the way to Multnomah Falls, visited by people all around the world. 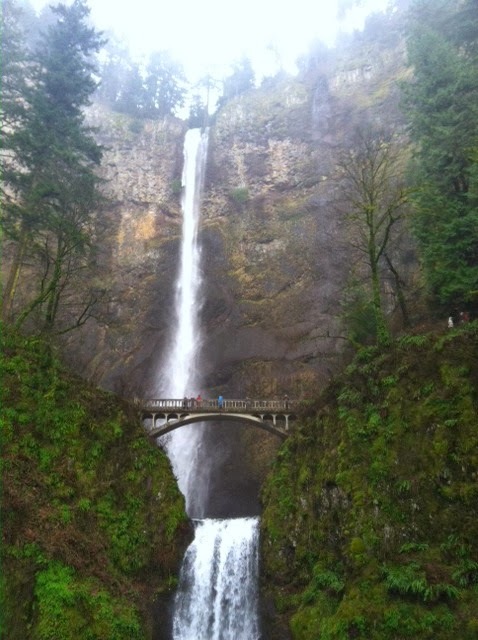 Every waterfall is impressive, but I think there are more impressive waterfalls than Multnomah Falls. It's like San Francisco to some people, worth traveling across the world to see. I guess I don't understand since I live here, and I see it almost every other month, but even so, it is one of nature's masterpieces. 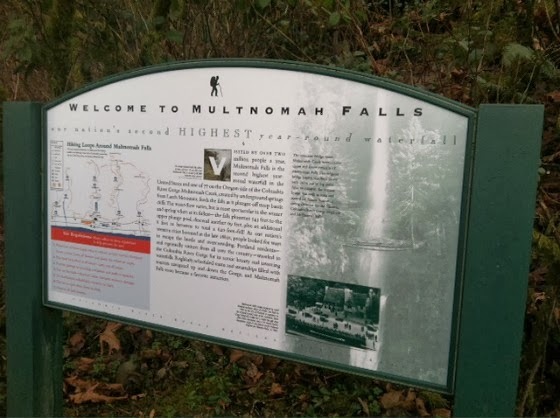 A couple of years back, my dad and I took a day and hiked up to Wahkeena Springs, the little pond of water that is the head of Wahkeena Falls. 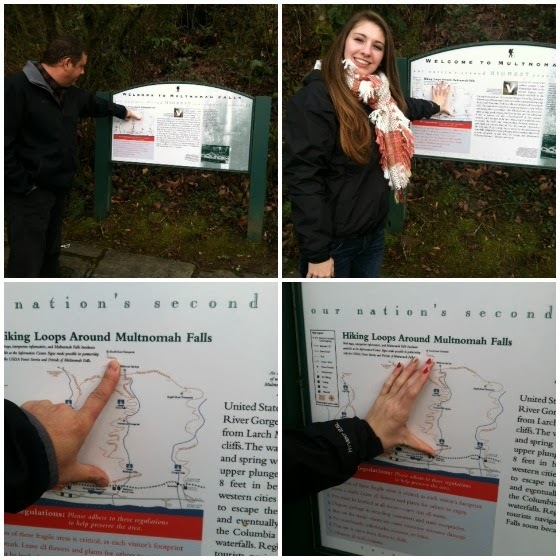 There was a map right next to the Multnomah Falls lodge. Here, we show you the trail that we walked on. It took us a good four hours to do that hike, and I would do it again. I remember taking a water bottle, and bottling some of the freshest and tastiest water I will ever drink. If you would like to read about the hike, here is link. Kind of cool to see the trails you have walked on a map like that. 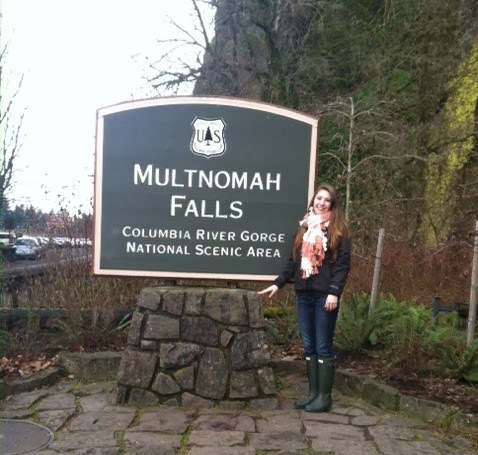 When we left Multnomah Falls, I decided to jump on the bandwagon as well, I had my photo taken next to the Multnomah Falls sign. I really am a tourist in my own. 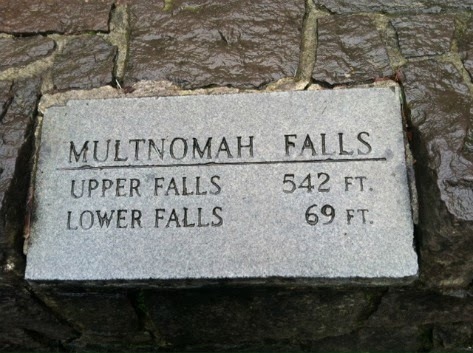 And onward to my favorite falls of them all, Wahkeena Falls. For as cold as it was, there were a lot of people in the Gorge today. I guess if it isn't raining, people show up, but even then, there are some crazy people in Oregon. *cough* *cough* the Biggs family... we have gone to Wahkeena in the rain, my senior pictures were taken at Wahkeena falls in the rain. Goes to show you that Oregonians don't care if it is raining anymore. We don't wear hoods. Anyway, at Wahkeena Falls they have these gates that open to the lower parking lot. Those are open during the Spring and Summer months, but closed during the Fall and Winter months. You can still go down to the picnic grounds by foot, but not by car in the Fall and Winter months. 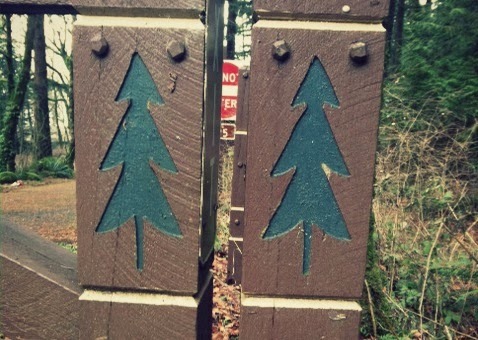 The gates have these cute trees on them, and I have never noticed the trees until today. I have been going here year after year, month after month, and have never noticed the trees on the gate! The plan was to build a fire in one of the fire pits, and hang out. 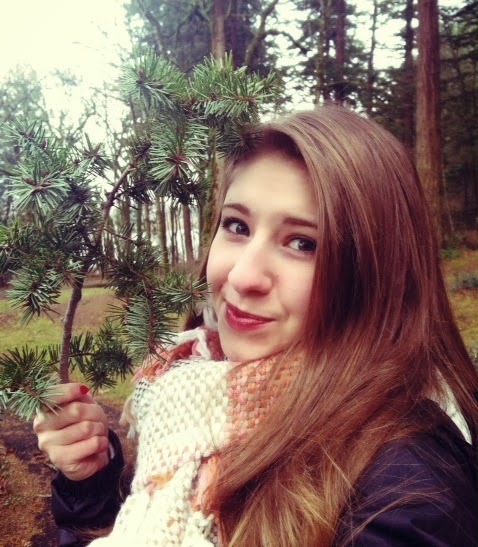 While my dad was trying to start the fire, I was being a flower child and prancing around in the nature. 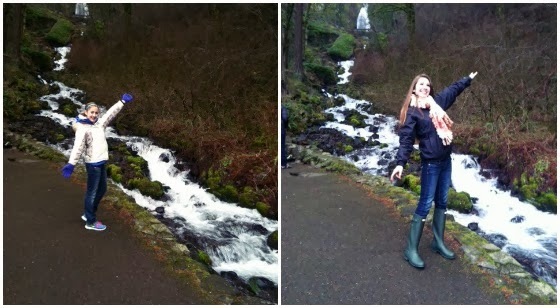 I sound like a nutcase, but it's what I do when I am at Wahkeena falls. 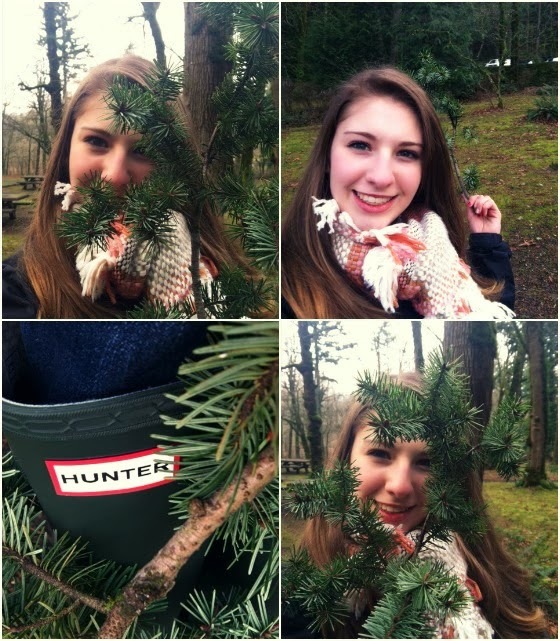 I am fixated on the foliage on the ground, and I have fun. I found this perfect tree branch. 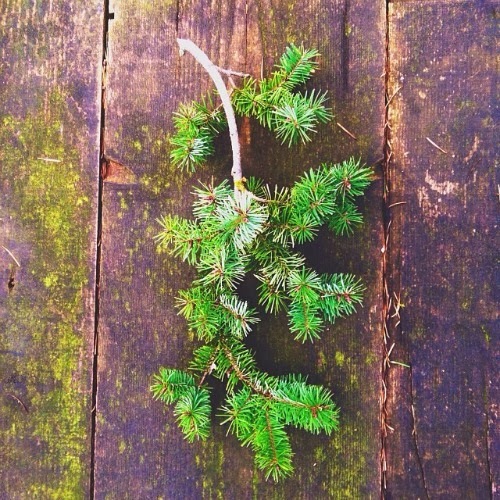 I have been trying to find a perfect tree branch the whole month of December. I have been wanting to stick on in a mason jar as a simple Christmas decoration, but could never find one to my standards, but this tree branch was absolutely perfect. I'm just a silly person sometimes. Meanwhile, my dad was still trying to build a fire in the fire pit. The matches wouldn't work on the rocks, and we didn't bring the lighter. What to do? What to do? When you are in a tough spot, and you need a fire, and you have a car, use the cigarette lighter in your car, and a ton of lighter fluid. 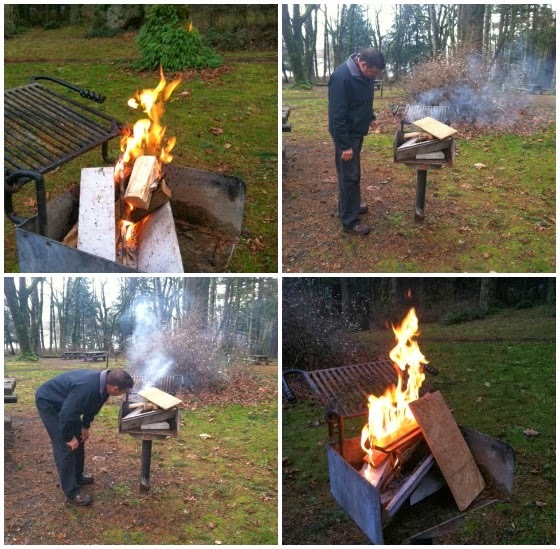 So my dad did just that, and he made a fire, he made a fire with the cigarette lighter from his car. 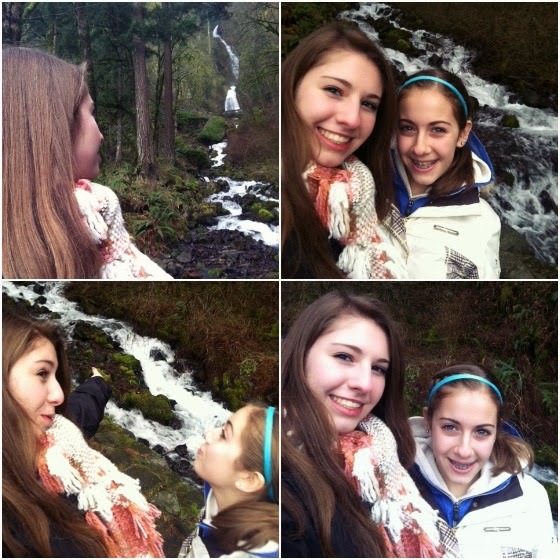 My sister and I wanted to go up to Wahkeena Falls, we didn't walk all the way up to the bridge this time, we just went to the lower bridge and took pictures. I accidentally crossed this lady's path, and I apologized and she walked passed me, attitude gushing out with "Whatever". Okey Dokey, don't let that ruin your day. My goodness! 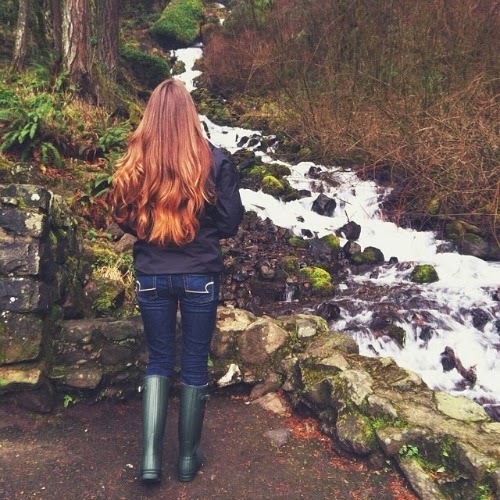 By the way, I love how my hair looks in this picture. Photo credit goes to my sister. 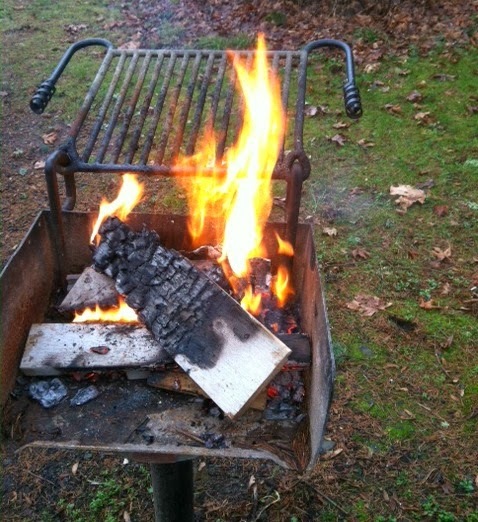 The fire was still going when we walked back down to the picnic area. It was actually starting to eat up the wood. I knew I should have brought my water bottle. When we wanted to go, we wanted to put out the fire fairly quickly and just leave. Well, my bad for not supplying my water bottle, but I came up with another solution. We fixed the grill so it would lay flat next to the pit. 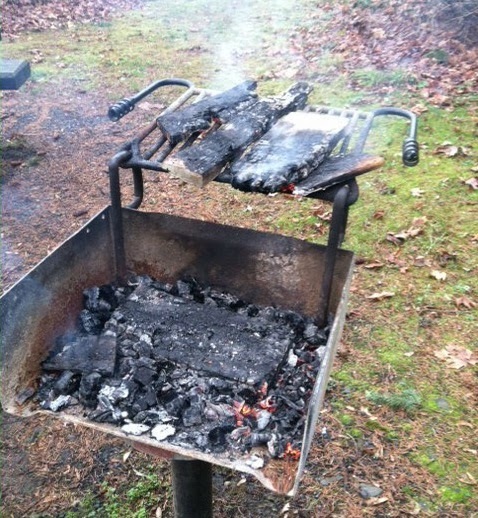 My dad separated the wood, and set the wood on the grill right next to each other to let the fire die out, and take away the main source of the fire. It worked! I was pretty proud of myself for coming up with that. I took the branch with me when we left, and when I arrived home, I grabbed a mason jar and put the branch inside with some water. It is a project I have been wanting to do all December, but again, the branches I came across did not meet my standards. This one did, and it is perfect. 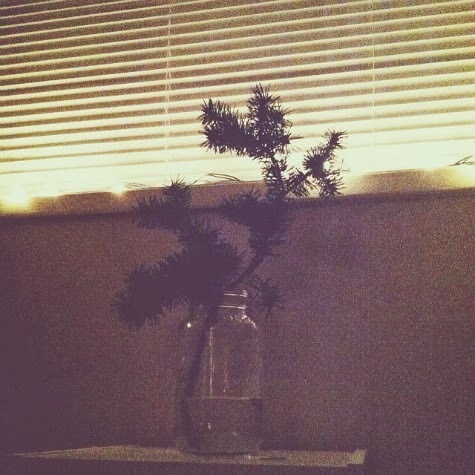 I wanted it dim in my room so the lights on my windowsill would twinkle through the branches. As a "last-minute" adventure, I'd say today was stupendous. Trying to spend as much time with my family as possible, they are pretty great people. dừng lại. Trong nháy mắt hạ xuống, hắn lật thân hình, đầu ngón tay trái vạch trên mặt đất, liền nghe một loạt tiếng động vang chói tai vang lên, thân hình Vương Lâm loạng choạng hơn mười trượng mới đứng vững. Lúc này toàn thân Vương Lâm gần như bị ký hiệu ở mi tâm bao trùm. Ký hiệu đó sau khi chịu đựng Thập Băng Quyền ý lập tức tán loạn, hóa thành từng điểm màu xám tiêu tán. Ở mi tâm chỉ còn nửa ký hiệu, chậm rãi tỏa ra màu xám mờ mờ. Sinh ấn do tu luyện tiên quyết giết chóc mà ra, giờ phút này chỉ còn lại nửa đạo ở mi tâm Vương Lâm, còn lại toàn bộ tiêu tan. - Lấy tu vi Anh Biến trung kỳ của ngươi, có thể chống cự lần thứ tư sụp đổ mà không chết. Ngươi lui ra đi! Chức Đô thống ngươi không có khả năng đạt được. Cho dù chức vụ Nghiêu lĩnh cũng không thuộc về ngươi. Vị trí của ngươi chỉ có thể là trường nham! Ánh sáng trong mắt Tả dực Yêu tướng tiêu tan, hắn chắp tay sau lưng nói một cách bình thản. Biểu tình của hắn mặc dù không lộ ra vẻ khinh thường, nhưng lời nói lại biểu lộ rõ!